This summer is all about communal time with hands at work and research labs that encourage collaborative problem solving from differing ways of knowing. Our projects will inspire you to stop and look around, take notice of the stones at your feet, wind on your face and the natural world around you. Sculptural butterfly nets, kites made from plants we have grown and gathered, woven bird habitats, painting and even making the paint — all of these experiences ask you to pause and look closer, talk with your neighbours, learn new skills and share your own knowledge. Do something new without leaving home: we have planned exciting learning sessions over holiday weekends to allow for fun ‘stay-cation’ time in town. Join these summer evening sessions to work on those self-directed projects you have long dreamed about beginning or completing. Need assistance for problem solving or a technique refresher? EartHand hosts are here to help get you going. Some materials and tools available, but generally bring your own ideas and supplies. We encourage all attempts at clothing mending, whittling, weaving, drop-spindling and more. Join Catherine Shapiro for a two hour exchange of what she has learned so far in her quest to create paint from her garden. Exploring pollen, indigo and other materials in which colour and pigment can be found. Includes hands-on lab time. Step-by-step gouache watercolour technique with a Master. 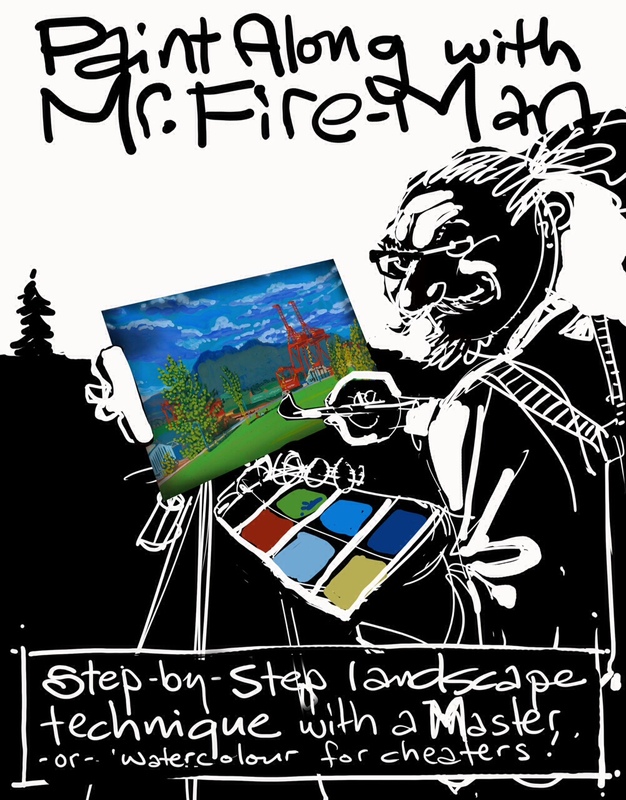 Students learn to break down landscape into simple layers that quickly build into competent renderings as they follow promptings from ancient advertising illustrator, Mr. Fire-Man. Gain speed, skill and confidence in your paintings with time in the field and instruction in the old ways. Previous experience an asset, but not required. Sorry! For reasons beyond our control this class had to be cancelled, we will likely run it again in 2017. 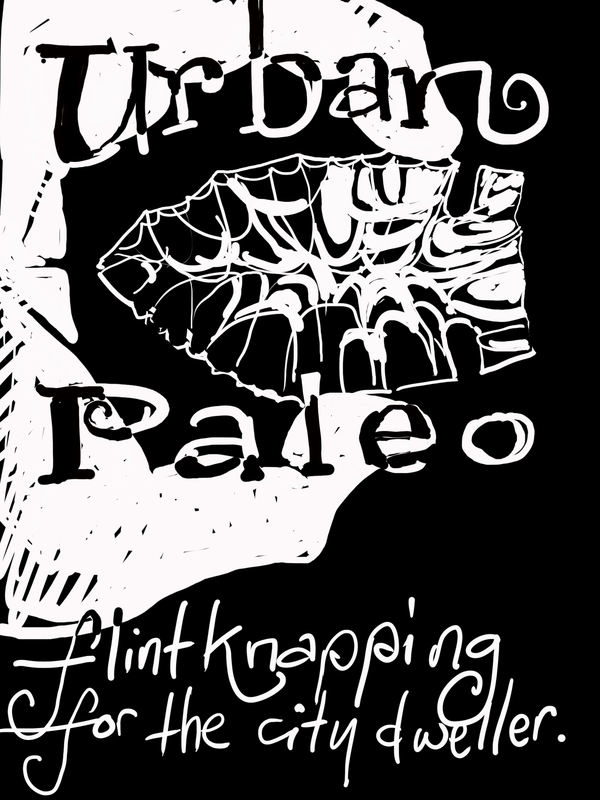 Begin your journey to learn the very ancient art of making arrowheads without leaving the comfort of civilization. Students learn percussive reduction techniques with traditional tools (antler, stone, copper) and to source their own materials in an urban environment (ceramic, glass and/or directions to the gem store). Guidance and instruction from local knapper, David Gowman, aides the student in forming a quick grasp of concept followed by the necessary time in studio, smashing rocks and glass until progress is made. Previous experience an asset, but not required. Register early, class max of 7, includes a half hour break for lunch. A potluck long-table family style picnic, group weaving project, performances by the Legion of Flying Monkeys Horn Orchestra and twilight outdoor screening by the Iris Film Collective-How could you miss it? BYO blanket and camping chair. Thanks to Vancouver Foundation Community Celebration Grants for assistance. This semi-weekly garden session includes everything from tracking seasonal patterns, weaving fences, weeding, drawing botanical pictures and harvesting from the land. Good conversation with snacks encouraged. Sun-hat, water bottle and closed-toed shoes recommended. Come out before the Maker Social to help with watering, weeding and harvesting as we tend the areas we manage in the park. Time-in becomes a trade for Maker Night attendance. Enjoy time at the always beautiful MOP while helping with seasonal tasks. Weavers of all abilities work together with Stanley Park Ecology Society Stewardship Group harvesting targeted invasive plants, then exploring various weaving methods to create habitats that meet the nesting needs of various species. * meet at SPES Pavilion by 9.50 to fill out a volunteer form if this is your first time volunteering with SPES. participants with weaving experience preferred. limited participation, book your place for 1 or more sessions **NB: when clicking this link, you will see the first session listed only; but when you click on the ‘Register’ button, it will give you all three date options to choose from. 3 day collaboration between weavers and stewards for brainstorming, sharing research and constructing prototype bird houses. As this is a group problem solving experience, we ask for a commitment of all 3 days to build a strongly collaborative team. Limited participation, book your place for 3 sessions. Sat & Sun 10-3.30 July 9 & 10 Trillium North Park weaving and construction both dates. From Soil to Sky is an opportunity for artists, gardeners, papermakers, spinners, woodworkers, kite-fliers and others to spend 12 sessions sharing skills as we collaborate in making the best-flying, most inspiring kites we can completely from materials that grow right in our neighbourhoods. Participation in these labs is by invitation and includes local skill holders such as traditional Japanese kite-making, paper making, woodworking, linen spinning and more. See the resulting kites debut at Vancouver’s Pacific Rim Kite Festival on June 11, and then at The Roundhouse Community Centre in the Window Gallery this July and August. 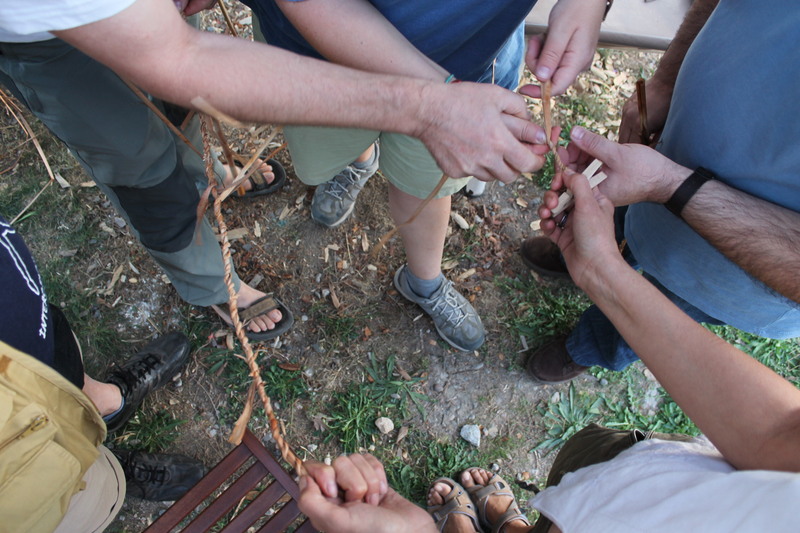 Join in our social work circles to make rope from blackberry vine for the creation of sculptural butterfly nets to hang in the pine trees alongside the pollinator pasture. Musicians welcome to come and play, some musical guests are planned. Picnic dinners encouraged.